Hundreds of people have held a rare protest in Vietnam against the unexplained mass death of fish on the country's central coast. Vast numbers of dead fish have appeared across some 200km (125 miles) of coastline since early April. A government investigation has so far found no links to a steel plant owned by Taiwanese firm Formosa Plastics. But many of the demonstrators in Hanoi blamed the company, and carried placards saying "Formosa Out". Other signs read "Formosa destroying the environment is a crime" and "Who poisoned the central region's waters?" On Friday Environment Minister Tran Hong Ha said the die-off was "a very huge and serious environment disaster" and admitted that the government had been slow to react. He said Formosa Plastics had been ordered to dig up an illegal waste pipe at its plant. The company has said there is no evidence that it linked to the die-off. Investigations into the cause are continuing. Large protests are rare in Vietnam, but police agreed to clear roads to allow Sunday's demonstration to go ahead. Much of protesters' anger in the past week has focused on a Formosa Plastics official, since dismissed, who said people in Vietnam had to choose between industry or its fishing industry, adding: "You can't have both." 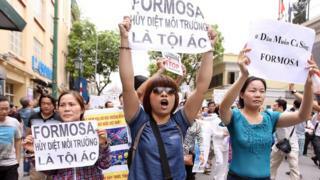 "Here is Vietnam's territory and there shall never be any case in which a Formosa steel plant has the right to tell the Vietnamese people to choose," protester Cao Vinh Thinh told Reuters in Hanoi. Many of those angry at the die-off have been writing online, using the hashtag #toichonca, or "I choose fish". Fishermen along the affected coastline are banned from selling their stocks, but seafood industry officials said exports, that bring in $6.6bn (£4.5bn) a year, would not be affected.